A DETACHED HOUSE , FENCED GARDEN AND VERANDA IN CHESTNUT. 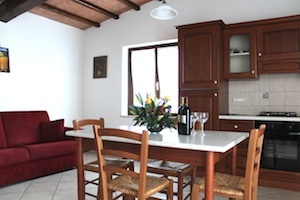 The farm has been carefully renovated with particular attention in maintaining the typical Tuscan country style. 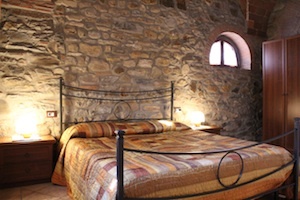 Both inside and outside the farmhouse has stone cladding walls with arches and ceilings made of handcrafted bricks that are our pride and a key unique feature of the building. 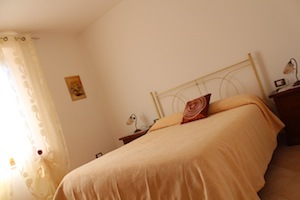 Inside we have two different sized apartments, all with double bedroom, living room with sofa bed and fully equipped kitchenette with fridge and microwave, bathroom with shower, LCD TV with satellite channels, air conditioning in the summer and duct-heating in the winter, mosquito nets, hairdryer, extra bed available, table and chairs for outdoor dining. Wifi connection is available outdoors. 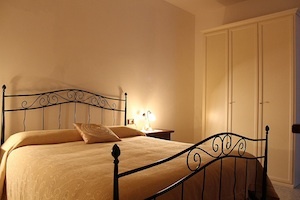 The apartments have been carefully designed by the owner, maintaining the feel of the typical Tuscan country house with stone cladding internal walls and handcrafted bricks vaults and arches, making them very stylish and welcoming. Each apartment has its own entrance as well as great outdoors facilities in the garden where you will find suitable tables for outdoor dining. The farmhouse is family run , so we offer the best recption available and round-the-clock service and comfort for your stay. We can provide information and bookings for: horseback tours, restaurant bookings and recommendations, Spa and Beauty Centres, excursions to Nature Parks, Etruscan archaeological sites, medieval villages, fairs and festivals.